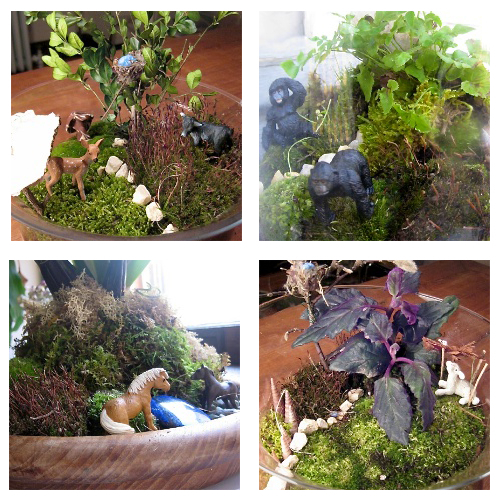 My friend, Johanna, has the terrarium fever – and she’s got it bad! Any glass vessels in her vicinity will suddenly be filled with strange flora and figurine fauna. She has even taken to the thievery of moss – something I certainly can’t judge after pilfering mulch and leaves from Central Park. After I saw a few of her creations, I asked her if she would send me some photos to share and she obliged. They remind me of the tiny and strange worlds that were on display at MAD this summer – bucolic, yet bizarre. I think my favorite is the one with the ponies. Or the gorillas. I can’t decide. 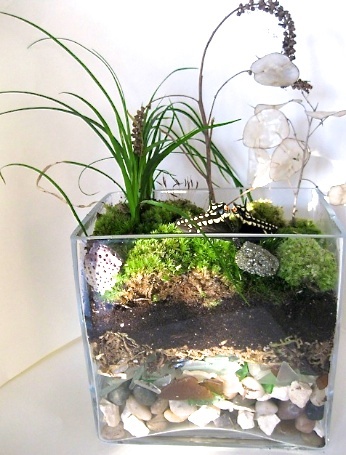 She has also put together a curriculum for teaching kindergarteners to build their own terrariums. It incorporates history (when did people start putting plants in jars, anyway? ), biology (did you know that there are over 12000 types of moss? ), organization (learning about the different elements in a terrarium and how they are layered), and creativity. Each child will go home with their own funky living environment to keep alive. Or not. I’m hoping to borrow the idea to use in my own daughter’s kindergarten class this spring. All this mossy-ness has me yearning for spring – a dangerous thing to do on January 19th. I think the reason why I am so drawn to terrariums (besides their obvious qualities) is because they are a beautiful way to bring the outdoors in. Especially if you live on the 9th floor of a building in Midtown. Some days you just need a little moss. You can also see some fascinating terrariums at Little Orphan Girl. This entry was posted on January 19, 2012, 7:23 am and is filed under Uncategorized. You can follow any responses to this entry through RSS 2.0. You can leave a response, or trackback from your own site. 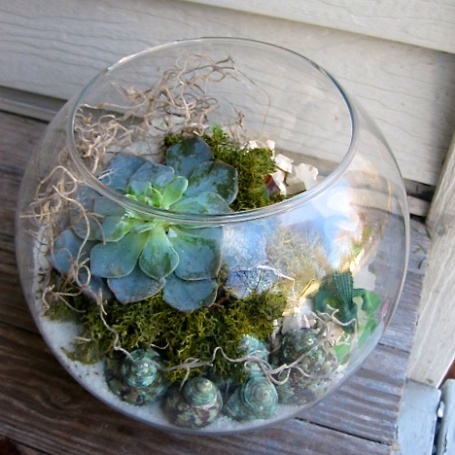 i love terrariums and these are beautiful! is she going to share or publish this curriculum? it sounds really great. my homeschool co op would so do this. we just made tiny ecosystems with pond water, fish, plants and pop bottles.